From left, James Coomer from DDN describes the company’s AI solutions to Rich Brueckner from insideHPC. This week at GTC, DDN is showcasing its high speed storage solutions, including its A³I architecture and new customer use cases in autonomous driving, life sciences, healthcare, retail, and financial services. 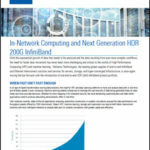 DDN next generation of A³I reference architectures include NVIDIA’s DGX POD, DGX-2, and the DDN’s AI400 parallel storage appliance. Through industry standard benchmarks and customer use cases using the new reference architectures, DDN will demonstrate how it establishes higher levels of application acceleration when combining the power of GPUs with parallel storage systems. Featured use cases will include testing results from the Max Delbrück Center (MDC) for Molecular Medicine in conjunction with Zuse Institute Berlin (ZIB). MDC is a leading molecular biology and clinical research center in Germany, and ZIB is an interdisciplinary research institute for applied mathematics and data-intensive high-performance computing. MDC originally partnered with DDN in 2018 to greatly accelerate its applications and to efficiently manage large volumes of data. Using an A³I architecture with an NVIDIA DGX-1 system and an AI200 from DDN, MDC was able to improve accuracy and precision within analyzed images while simultaneously accelerating training performance by 240 percent. More recent testing with an A³I architecture comprised of NVIDIA’s DGX-2 system and DDN’s AI400 revealed results that more than doubled previous improvements. DDN Partnership with Robovision. With many customers expressing concerns around implementing AI successfully, DDN is excited to partner with Robovision and its self-service deep learning platform, which enables organizations to bring concrete, maintainable AI applications live in mere weeks. New DDN PartnerLink Program Tier. During the GTC conference, DDN will be launching a new Platinum Tier within the DDN PartnerLink program, exclusively for NVIDIA DGX-certified resellers of DDN A³I with NVIDIA DGX-1, DGX POD, and DGX-2. This specialized tier is designed to provide added support to the resellers who work closely with AI and deep learning customers and best understand their needs, and to support them with the highest quality of service. The new tier will provide resellers with exclusive offerings from DDN, including access to proof of concept units for qualified opportunities, special pricing for demo units, guaranteed margins for registered deals, and special pricing on DDN A³I with NVIDIA DGX systems. DDN’s renewed focus on the channel over the last three years has strengthened our relationships with both customers and partners. We are excited about offering the Platinum Tier and to continuing to differentiate our channel program with focus and expertise,” said Dean Koester, senior vice president of field sales for Americas and Europe at DDN. DDN Presentation at GTC: Edge to Core: A Meta Study of Data Complexity in AI. On Tuesday, DDN’s Dr. James Coomer, senior vice president of product, will present “Edge to Core: A Meta Study of Data Complexity in AI,” which will discuss the challenges uncovered in AI and deep learning workloads, the most efficient approaches to handling data, and use cases in autonomous vehicles, retail, health care, finance and other markets. The presentation will cover the complete requirements of the data life cycle including initial acquisition, processing, inference, long-term storage, and driving data back into the field to sustain continuous improvement. Dr. Coomer will also provide examples of data life cycles in production that trigger diverse architectures from turnkey reference systems with NVIDIA DGX systems and DDN A³I to tailor-made solutions.